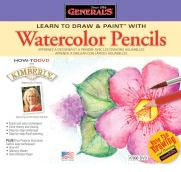 Projects, Tips and Techniques - General Pencil Co., Inc. Welcome to Kathi’s Korner! We’re so glad you stopped by to browse and we look forward to your return visits. Within this site you will find art projects for artists of ALL ages and skill levels as well as fun “special technique” projects! We will also feature new ideas to expand your current art style, educator classroom art projects, simple 1-2-3 step projects in several mediums, and so much more! Our goal is to have something for everyone and we will be constantly adding new projects, ideas and art facts to our site. Compressed Pastel. Great for Educators!